We have equipped our clinic with state-of-the-art technology designed to deliver a more comfortable and efficient experience for our patients. Read on to learn more about the technology you might experience during your care. 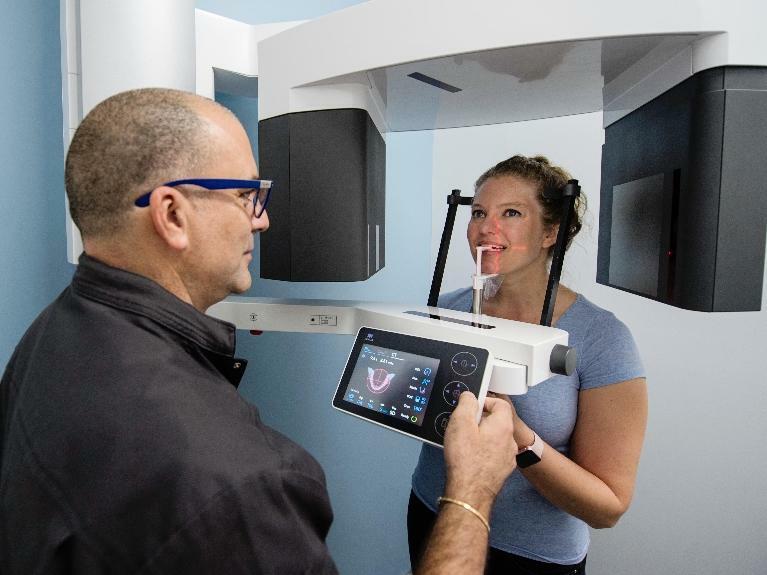 Digital dentistry, including x-rays and records, allows us to better streamline information at Casuarina Square Dental Care, in turn making it more convenient for our patients to access their records, or communicate with other pertinent providers. Digital x-rays offer numerous benefits to both our patients and our dentists. They emit 80% less radiation than traditional x-rays and also do not require harsh chemicals for developing, which is better for our patients and the environment. At Casuarina Square Dental Care, we are able to offer both small and detailed intra-oral x-rays and panoramic images, which give us a view of the entire mouth. Digital x-rays offer a clearer image and are available for immediate viewing. This means our dentists are able to more accurately diagnose treatment needs in a timely manner. Nothing helps patients understand their treatment needs better than a full color image of their teeth! Our intra-oral camera allows us to display a clear picture of what is happening with the teeth and mouth, allowing patients to make educated decisions about the treatment procedures that are right for them. Patients who feel fearful or anxious about their dental visits may avoid getting the care they need. If you feel this way, you are not alone, and we have solutions for you at Casuarina Square Dental Care. Nitrous oxide can help patients relax during most types of dental appointments. It is a gas that is administered through a mask worn during the procedure. Nitrous oxide helps patients feel at ease, yet it will quickly leave the system once the mask is removed. It is safe for children, and because its effect wears off so quickly, it is also safe for patients to drive home and resume normal activities after the appointment. If you are interested, we are happy to discuss using nitrous oxide sedation for your dental procedures. The CBCT scan is a newer form of technology that takes our X-ray capabilities to the next level. Since our teeth and jaws are not two-dimensional, traditional forms of X-rays are often not sufficient for displaying certain dental conditions. With our CBCT scan we are able to capture three-dimensional images to better diagnose and treat a wide variety of conditions including dental implant planning, root canals, and managing impacted teeth. We recommend planning on twenty minutes for the set up, the scan, and for viewing your images but the procedure itself only lasts a matter of minutes. We will carefully position you for the scan, once started the CBCT will move in a circular motion around your head but will not touch you. Once the scan is complete we will discuss the images and suggest a treatment plan for your individual dental needs.